First and foremost, you’re going to need to make sure you’re not providing the mice with a readily available food source. This means keeping your countertops and other surfaces spick and span while ensuring all your other foods are sealed in containers and stored away. It can be easy to overlook your pet’s food during this process, so don’t. 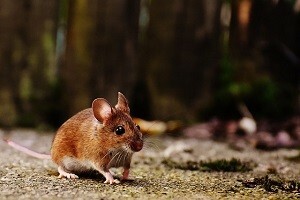 Food for your dog or cat is a real draw for mice, so remember to seal and store away your animal’s sustenance as well. A neat trick for preventing rodents is installing a brush strip to all exterior doors. This way, small gaps at the base (common in older doors) will be blocked off, thus giving mice fewer entry points to your home. Not only are brush strips easy to install, especially the ones with adhesive strips, but they can also help prevent your home’s heat from seeping out through the gaps in the door during the cold months! It’s a win-win. If you’re big on having fires during the winter, listen up. Your wood pile outside is a fan favorite among our rodent friends. These piles are typical hangouts for mice, which means you should elevate your log pile 18 inches off the ground at the minimum. Not only will this make it much tougher for mice to nestle in amongst the cut wood, but it’ll also keep you from having to completely dig out your wood when it snows! These are just a couple ways you can go about making your home non-rodent friendly this winter. We’ve still got plenty of cold times ahead of us, so it’s not too late to implement our tips. If you can’t seem to shake your mouse problem, get in touch with us. Fill out our online contact form!